EXPOSED: Phoenix News Reporter Caught Lying About Vandalism of Confederate Memorial — Condition Yellow: Stay Alert. Stay Alive. The brazenness of some "journalists" never fails to amaze us, particularly those on the left. This report hints at just one instance of the misinformation media outlets will shamelessly put out to further a divisive narrative. White spray paint covers the stone memorial and placard. A crudely-made cross was added as well. According to the original story (which has since been updated), 12News reporter Bryan West claimed he and his crew arrived at the Arizona State Capitol just in time to witness the suspect departing. Apparently, it wasn't until the vandal left that they realized the monument had been covered with white spray paint. The raw footage clearly shows the suspect on his bicycle riding up to the memorial with the Channel 12 news van arriving, headlines ablaze, just seconds later. As the vandal sets to work, the aerosol spray can be seen wafting through the glow of the headlamps, visible even on the grainy footage. Yet somehow, West and his crew claimed that they "could not see the vandalism from their vantage point." Dean Ditmer, the station’s general manager and president, did not immediately respond to a request for comment on Friday. Ditmer’s statement to New Times and the revised Channel 12 article still don’t quite square up with the surveillance images. In fact, the surveillance video shows that the van was parked near the monument, and that the view was not exactly “obstructed.” The suspect was in the dark for much of his act, but on several occasions he was lit up by the headlights as he worked. If Bryan West is not a bold-faced liar, why the attempted cover-up? This was not the only suspicious news story released. Channel 3 (KTVK-TV) and Channel 5 (KPHO-TV) published the surveillance video on AZFamily.com last week, but edited out key scenes of the suspect's arrival and departure. 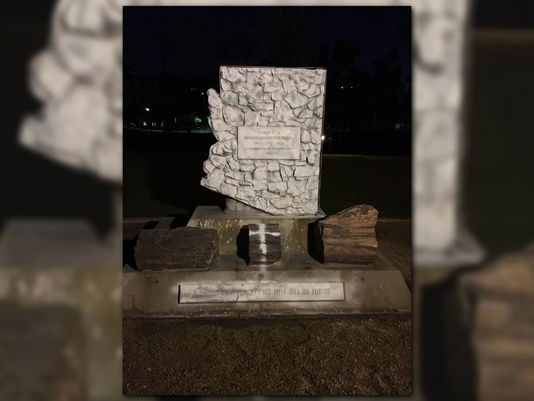 AZFamily also cut out the part near the end of the video where West and the cameraman show up, and the report failed to explain to viewers that the source of the light on the memorial is a news van's headlights. The news is no longer news, but merely a selection of stories designed to amuse, anger and frighten.